Seriously. If in 5 years time I’m a tenth as hot as she is now I’ll be one happy girl. Who do you want to be when you grow up (or grow down!)? 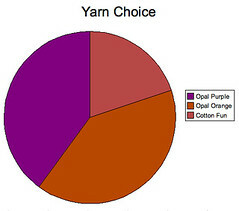 Today, I give you yarn photos! I got some Socks That Fit in two colours and two weights. What? I’ve got to replace the yarn I’ve given away! That’s a warning for the Lorna’s Laces I’m hoping to acquire in the near future! 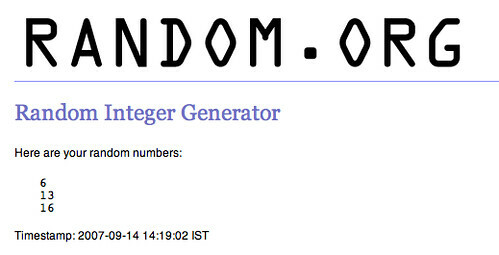 1: contest winners – Stacey, your yarn was sent Airmail on … Thursday? Something like that. Amy and Britt, I’d only found one padded envelope earlier this week, so yours will be sent next week if I can get into the loft where I know there are some hiding! 2: if you drop a cheese grater from the work surface, do not attempt to catch it with your ankle bone. Mashup Madness by Kristi, in the “Screaming Dutch Orange” Opal yarn! In the effort of full disclosure, there was a late entry that got caught in the spam-filter. I got it in time, but not until after I’d done the graphs. Be reassured that your name was in the draw and your vote didn’t effect the outcome of the winning combo (other that to re-affirm it’s winning position)! Thanks to everyone who voted and helped me make up my mind. I appreciated the reasons you gave as well. 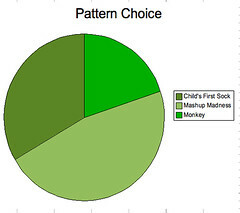 The other socks (Child’s First Sock in Shell Pattern and Monkey) will be knitted in the near future, so feel free to stick around and see how that turns out! 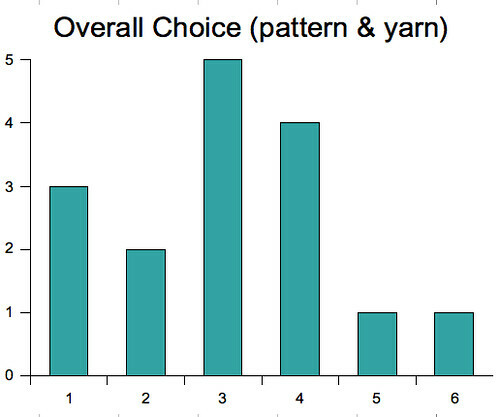 17 people entered the contest to help me decide what socks I should knit next (17 on the post, 1 on another post, minus Mrs Dr. Who who was of no help whatsoever!). Nobody said they didn’t want in. I contacted Stacey, Amy, and Britt (in that order) and they chose the Esprit, the green and blue Puzzle and the green and blue Puzzle yarn respectively (I had four balls of the green/blue, so it was all good!). I’ll be sending your prizes off surface mail (what? I’m part Scottish!) as soon as I can get to the post office. Thank you to everyone for playing, and I look forward to knitting the winning pattern soon! 31st Dec 2014: temporarily removed from sale due to EU VAT digital sales law. Inspired by the colourway of my yarn, MacIntosh, I started thinking about apples. I then remembered the tale of the English mathematician and code-breaker Alan Turing who died after eating a poisoned apple. It is said that the Apple Macintosh computer logo is an homage to this brilliant man. 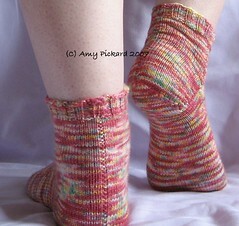 In this top-down sock, garter stitch flows from the ribbing, through the leg, into the heel and on to the foot. The ankle-length leg is perfect for a summer sock, but it is very easy to lengthen to your personal taste. The heel is a deep style called a German Heel (appropriate given the role Turing played during the Second World War at Bletchley Park) and the toe decreases are more widely spaced than usual to fit in with the overall design. This would make a great men’s sock, made in slightly more sober colours (or not, as the case may be!). Needles/notions: Set of 5 2.5 mm/US 1.5 needles (or size to obtain gauge). Row counter and stitch markers (optional). Sizes: Small to fit 7-8”/18-20 cm, Medium to fit 8-9”/20-23 cm, Large to fit 9-10”/23-25.5 cm (Size shown is Medium and is on a 9” foot). 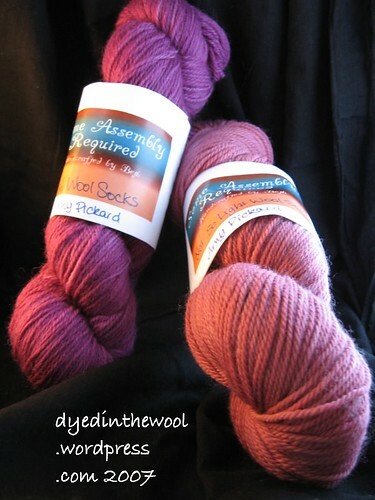 Click here to add to your Ravelry Queue.